Friends of our family were given some news a couple of months ago that ripped their world apart. Their five year old daughter, Eva has been diagnosed with DIPG, a rare form of cancer. Her brain tumour is inoperable given the lack of research the treatments are limited. As a mum to a five year old girl myself my heart instantly broke for them all. I can not even begin to imagine how they begin to digest and deal with this but I have been following their story through their Facebook page and they are truly inspiring. Funding and awareness is what this condition desperately needs. Please take time to read through this blog and share on all your social platforms,Twitter, emails, Facebook, Instagram. Share it for a little girl, to help her and her family fight and find a cure for her and all the other children affected by DIPG. ‘What is DIPG like for the parents? All the stuff you might imagine, we are heartbroken, crushed, angry, scared, sometimes despondent, sometimes highly focused. All of these things mashed together fighting for dominance. With all these emotions, I feel I can only show one face to the world, the one where we are highly focused in fighting for Eva’s life. Back in April Eva’s MRI scan revealed she had a tumour, but at that time we had no idea what exactly we were dealing with. A few dark days followed where Eva’s condition detreated to the point she could no longer swallow her food. She lay in bed and watched TV unable to do anything unaided. As a parent, I found this the most difficult stage so far. She was scanned on a Thursday and we couldn’t get transferred from the local hospital to Royal Marsden until the following Monday, because NHS essentially closes down on the weekend. Three long days later Eva was transferred to RMH she travelled with Mum in an ambulance and I drove down to meet our consultant and hear the prognosis. In retrospect, I think I knew on some level the severity of the tumour. It had been written all over the doctor and nurses faces at Margate hospital. Everyone we dealt with was careful not to give us too much information, or hope. The first time I heard the words Diffuse Intrinsic Pontine Glioma (DIPG) was in our consultant’s office at Royal Marsden on Monday 18th April 2016. It took a few days for it to properly sink in, but those words are essentially the worst words you could hope to hear in our position. DIPG is incurable. DIPG is inoperable. 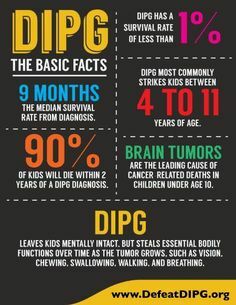 DIPG has a survival rate of 0 to 1%. Worse, of those 0 to 1% some cases may have been misdiagnosed. Why? Because DIPG is not routinely biopsied like every other type of tumour. Why? Because thirty odd years ago someone decided an MRI scan was enough to diagnose DIPG, and biopsy was an unnecessary risk. So while every other brain cancer has live samples stored in databanks across the world, and used for decades by researchers to study towards a cure, DIPG was forgotten. That is until a few years ago when French researchers decided to start taking tissue samples from DIPG patents. This has consequently opened up exciting new opportunities for DIPG research. They have finally identified a genetic trend that follows in the majority of tumours, particularly in ‘typical’ cases of the average age group of DIPG patients. That’s great, right? Not quite. DIPG is still far behind other cancer treatments, not only because of the lack of knowledge, but due primarily to the lack of funding. 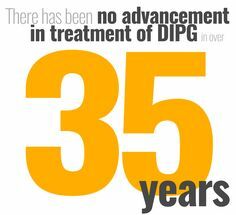 DIPG is ultra-rare, but there are still thirty to forty children diagnosed each year in UK. Over three-hundred children in US. It makes me sad that the public get so aroused by stories about a kid that falls into a Gorilla pen, and God forbid, the zoo keepers shoot the Gorilla. Yes it is sensational, but if the public care so much about the death of a Gorilla, or the safety of Zoos in general, why aren’t they just as passionate about our children dying each year, consistently, from a disease that could potentially be cured? What would happen if forty kids a year were killed by terrorism in UK? I suspect the public would be very aware, and I think the government would try very hard to stop it. DIPG is perhaps not as newsworthy, but the end result is the same. Rather than a quick explosion, DIPG children slowly lose control of their bodies. Their minds completely unaffected, still alive and bright, trapped inside a body that shuts down until they are paralysed inside themselves, until their brain can no longer control breathing. Then they die. And this happens again, and again, and again. During our first meeting, our consultant explained in black and white what it meant to have DIPG. He was very careful not to offer us hope. Radiotherapy is the standard treatment. It’s palliative, and gives maybe an extra three months. In our case, it transformed Eva from a shell of her old self, back into the girl we remembered. We are a few weeks on from radiotherapy now, and still a week away from her second MRI scan and we have our daughter back. I’d like to ask the “miracles do happen” people, and the “focus of the survival rate” people, if in the above situation they would sit back and watch a film content they were in that 0% to 1% bracket, or would they ponder their impending doom? Yes, miracles do happen, I’m sure, but people need to understand that in this kind of situation you need to mentally prepare yourself for the terrible, unthinkable, heart-breaking, yet most likely outcome. Even if it makes for an awkward conversation, as a parent I simply don’t have the luxury of wishful thinking. In addition to our RMH appointments, my wife and I reached out for a second opinion. Not because we don’t have faith in our consultant, but because we have no medical training and therefore need to hear multiple expert opinions and compare against each other. And whether we want to believe it or not, medical research is still a business, and business is inevitably surrounded by ego, politics, and IP protection / publication races. So where does this leave us? We are left with few options. As DIPG parents it is up to us to research available options. To fight to get our child into the right treatment or trial. It’s up to us to raise funds to pay for these treatments, or to use to fund research that might just be the breakthrough Eva needs. As DIPG parents, we are in the unique position that our consultants can’t direct us to a “proven” treatment. We are left to navigate the minefield of social media and sift through the opinions (often dressed up as facts) of untrained parents and advocates of certain treatments. The hard fact is that no treatment or trail is currently offering proven benefits over any other. Some treatments are better promoted than others for sure, some fall completely under the radar. What way do we turn? After considerable debate, we decided to ask for a referral for CED treatment in Bristol. This was due to the fact it’s only a couple of hours drive from us, and there is anecdotal evidence that some children are responding well to treatment. After the mandatory losing of the referral (something that’s happened on every single referral we’ve had since GP diagnosis – chasing referrals is part and parcel of the job), we finally heard back from Bristol and they are over capacity. Unfortunately, this brings us back to my earlier point. DIPG is massively underfunded, so even if your child is incredibly unlucky and has this ultra-rare children’s disease, the chances are you will not get her into your treatment/trial of choice. Please spread the word, sign the petition and donate whatever you can. Cancer isn’t picky, it chooses at random, do this for Eva and for all the children that DIPG is attacking, and all the children it might pick next. *Since this was written little Eva passed away just before Easter. Instead of celebrating her sixth birthday with cake and a party, Evas parents were visiting her grave. Since writing this I have discovered how many children are cursed by this awful disease. 17th May is #DIPG go gold and grey… Please wear gold and grey to help raise awareness of this awful cancer that is stealing our children. Heartbreaking. I cannot even begin to imagine. Sending much love to you and the family.